People often say that classic cars are made of "real steel." Unfortunately, real steel has a habit of rusting. This happens quite quickly anytime the finish (primer or paint) protecting the outer layer of the steel is exposed to water and salt that's lying on the road or is in the air. Causes of this type of exposure can range from severe paint barrier damage from the car being in a serious collision damage to a tiny scratch caused by rocks that the wheels throw up to hit the body. Wherever paint and primer protecting the metal is removed, rust will start. 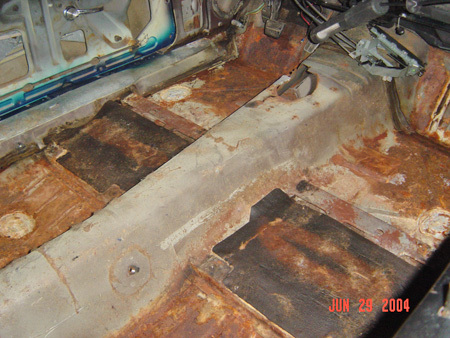 Also, cars that have been sitting unprotected for a long time can develop surface rust. This is because UV rays from the sun, as well as other environmental contaminants can break down the protective barrier provided by paint. Rust problems showed all over the floor of Jeff Noll's '67 Camaro after the car was disassembled. Rust can only be properly repaired by stopping its spread, cutting out any rusted-through metal, installing new metal and doing body work. As we all know from classified ads in hobby magazines, the geographical location of a collector car can have a big effect on its likelihood of being rusty. "California cars" are prized by collectors for their legendary "rust-free" state of condition. When a car spends decade after decade in states like Michigan, Wisconsin and Minnesota, it is typical to find both obvious and hidden rust. Excessive amounts of rain can cause rust, but the worst culprit is winter driving in areas where road salt is used to reduce snow and ice on the highways. Hobbyists often refer to the Northeast, Midwest and Northwest as the "rust belt." There are several recommended ways for motorists to deal with minor rust in a maintenance sense. 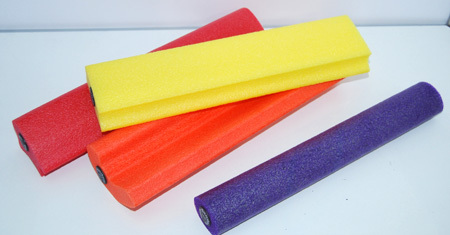 These foam rubber Soft-Sanders from Style-Line Corp. are the latest in sanding block technology. For about $40 you get six 11-inch blocks in three densities plus a hand sanding tips and techniques DVD. Sanding: Remove loose particles of rust down to bare metal with course sandpaper. Use finer sandpaper to smooth edges of chip. Then "touch up" bare spot by brushing/spraying/dripping on color-matching touch-up paint. Sanding the car using an air-powered dual-action "jitterbug" sander, such as this Ohio Technical College instructor is using, is a faster way to remove paint and rust or do an initial smoothing of filler or primer. Wire Brushing: Removes loose particles of rust. The brush is lightly worked over the blemish. Once the brush hits bare metal, the primer and paint are "touched up" with a (hopefully) matching color. Smooth with fine sandpaper. Razor: Removes damaged paint and loose particles of rust. Then "touch up" bare spot by brushing/spraying/dripping on color-matching primer and touch-up paint. Sand surface as smooth as possible with fine sandpaper. In the "real world" ongoing paint touch up repairs like these are rarely carried out with any consistency. If they are done at all, they are often done improperly. Usually, the touch-up paint is dabbed on right over the break in the finish, with no real attempt to remove the existing rust. If you're very lucky, you'll find that such do-it-yourself repairs were done enough on your vintage car to at least save the metal from totally rusting through. However, it is much more common to discover old cars with significant amounts of obvious and hidden rust. Rust is like a cancer, often spreading unseen through a steel car body until it is too late to do anything about it. Once corrosion starts poking through the sheet metal, it can no longer be repaired by simple methods like those listed above. Instead, the corroded metal sections must be entirely cut out. Then, all areas that the rust has affected must be completely cleaned up or replaced. Rust starts in places you can't readily see. When you finally do see it, it's usually much worse than it looks at first. Sometimes it is amazing to scrape away rusty metal and watch a body panel or chassis piece disintegrate before your very eyes. When the oxygen in the air "oxidizes" unprotected metal it creates iron oxide, which has the orange or brown color we associate with rusty metal. Phosphoric acid is a relatively mild acid that is commonly used to dissolve iron oxide. A characteristic of phosphoric acid is that it does not eat up rust as fast as other caustic agents like hydrochloric acid. Since it works more slowly to dissolve rust and it can be left on a metal surface for a longer amount of time. Phosphoric acid causes a chemical action through which hydrogen is formed. Hydrogen can cause hardened steel to become more brittle. This is called hydrogen embrittlement and will be discussed in detail later in this chapter. In any case, parts made of high-strength, heat-treated steel are prone to this problem and should not be cleaned for long periods of time with phosphoric acid. One of the desirable features of phosphoric acid is that it leaves behind a fine coating of iron phosphate, which is a rust preventative material that keeps bare metal from being attacked by flash rust. Keep in mind though that this coating is thin and not very durable. It should be considered temporary protection until a primer can be applied. Some hardware stores sell a diluted phosphoric acid product called Ospho that works well to remove rust on old car parts. Other phosphoric acid products like DuPont's 5717S Metal Prep or MetalPrep 579 will remove light rust and prevent its return for a short time. Such products work best when they are duluted and poured into a tub in which heavily rusted parts can be soaked for several weeks. Slowly and surely, the rust will be removed and the steel will be left with a gold colored coating that protects the metal for a couple of days, at least until it can be painted. Acids will not work on cast iron and spring steel. If treated a long time, spring steel will vanish in days. 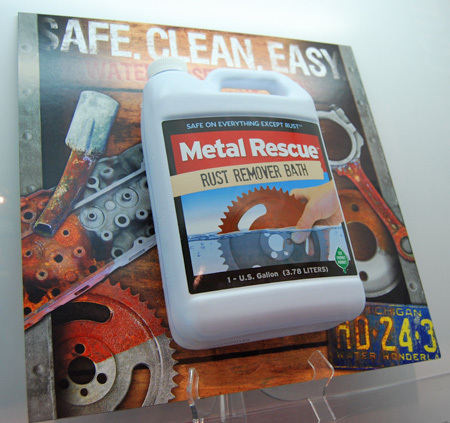 Water-based non-acid rust removers such as Metal Rescue are the latest thing in chemical rust removal. The manufacturer claims it is safe on everything but rust. You simply soak and rinse parts. Blue Lightening is another brand. Another product that's popular with restorers is one that chases rust away more rapidly. It is called Blue Lightning Rust Remover. This solution comes in a one-quart jar selling for around $20. The Blue Lightning Rust Remover has a fast-acting formulation and quickly dissolves rust. A restorer can spray it on a rusty piece of metal, then wash it off with a stream of water from a garden hose. It is not a rust converter, but it will clean the metal very quickly and other protection products can be applied. Blue Lightning Rust Remover is said to contain no acids, lyes or caustics. The manufacturer claims that it works on all types of paints, varnishes and even powder coats. Web postings say it works well, but some hobbyists feel it is expensive. From what we have seen posted, Blue Lightning looks like it would save as much in time value as what it costs. Some car restorers use Muratic acid — which some folks call swimming pool cleaning acid — to remove rust. It is readily available wherever pool supplies are sold and can be found in any hardware store, too. Muriatic acid is also known as hydrochlotic acid. It is actually hydrogen chloride mixed in water. It is a corrosive mineral acid that has numerous industrial applications, including use as a cleaning agent in the "pickling" of iron or steel to remove rust from the metal while it is being processed. It will clean old rusty metal, too, but is probably not the best agent for de-rusting old car parts. It is recommended for use in cleaning varnish from motorcycle gas tanks. 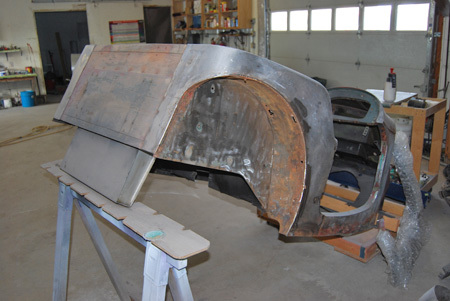 Hot tank stripping or chemical dipping is a very effective way to remove both rust (as well as paint and other finishes) from metal car parts. It will remove everything on the metal and will even eat some metals. Chemical-stripping typically leaves the item that goes through the acid bath looking fresh and clean and ready for bodywork. It works especially well on individual parts. The companies that offer the chemical dipping process have giant tanks that are large enough to hold a complete car body or pickup truck cab. The body assemblies are dipped into the caustic solution for several hours. The rust eating acid flows into areas where a media-blaster could never get. The combination of heat and a strong acid bath really cleans metal well. It works fantastic. After dipping a vehicle or parts into the caustic solution, they must then be dipped a second time into a neutralizing bath that removes every trace of the acid. 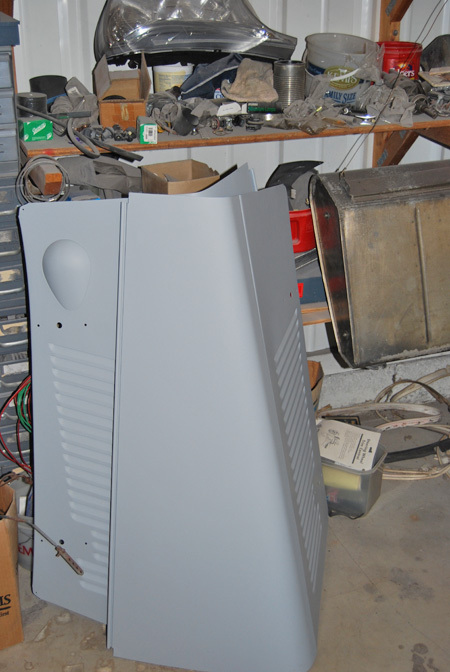 There are few facilities that offer this process to auto restorers. This service is not available everywhere and it is common to find only one hot dipping facility serving an entire state. The strippers will usually electro-coat or "e-coat" the dipped items after the sheet metal has been treated with a neutralizing agent. 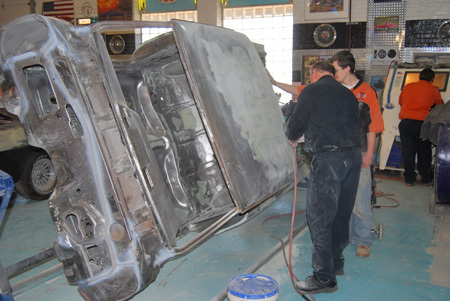 The vehicle dipping and stripping process involves several other prep stages before the e-coat primer can eventually be applied to protect the bare metal. 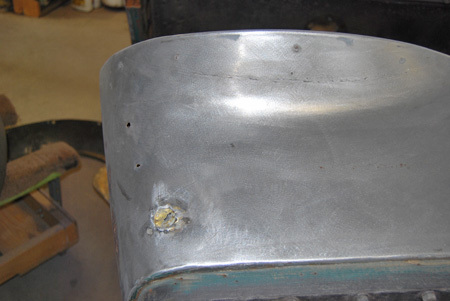 This is a close look at the right-hand cowl section of the author's MG TD after it was de-rusted by the dip tank method. The acid bath removed all paint and rust and revealed a hole once drilled for mounting a radio antenna. By coincidence, while writing this book, we had a collector car in a body shop and the shop owner suggested we use hot tank stripping to clean the metal. It was not a muscle car or Resto-Mod, but a tiny 1952 MG TD roadster. From what we had heard about dip tanks, we realized that this car was a perfect candidate for dipping as the fenders, running boards, gas tank and hood all had rust and many heavy layers of paint on them. We never actually went to the dipper — the only one in Wisconsin — that did the work, but we were very impressed with how clean the parts were when the body shop owner brought them back. You will notice that we did not mention having the body tub dipped. The MG body is attached to a wooden frame and dipping cars with this type of construction is one of several big "DON'Ts to keep in mind about dipping tanks. There are actually several things to be concerned about if you're having a vehicle dipped. The problem that you hear of most is that the caustic solution in the dip tank can get into hidden areas where it remains after the dipping is completed. By hidden areas, we mean channels in the metal, gaps between flanges and crevices formed where more than one panel come together and get welded together and areas under door, trunk and hood bracing. There are many such areas on cars made from the mid 1930s up. Luckily, the main body structure of the MG TD is built more like an early 1930s car with the edges of sheet metal panels bent to a 90-degree angle and nailed to a wooden frame. Since the MG TD body consists of sheet metal nailed over a wooden frame (not the wooden rear body panel that's normally hidden by the upright fuel tank) this body had to be stripped with a DA sander rather than dipped. In addition, on the MG, there are very few areas in other parts like the fenders, running boards and hoods where a caustic solution could take up residence and seep out later to attack new paint. There is a bead on the edge of the fenders and openings on the hood panels for the hinges, but it is relatively easy to spray or dribble a neutralizing agent down into these spots. That's why the MG — or at least its parts — were perfect to de-rust using the dip tank method. On the other hand, we discovered that dipping the wood-framed MG body tub into an acid bath was a big NO-NO. According to the experts at a rust removal specialty business called Metalworks, located in Eugene, Oregon, dipping any car or truck body with wood attached to it isn't a real good idea. The old, porous wood will soak up the caustic solution and hold it just like a sponge. This can ruin the wood, but the bigger problem that the metal can't be fully cleaned and neutrualized where the wood is attached to it. "Not many vehicles have this concern to begin with," says Metalwork's Website (an Internet stop that is definitely worth a visit if you're thinking about having your collector car stripped of rust using the dip tank method) "However, if you have an older vehicle with wood in it, dipping might not be for you." Companies like Metalworks can dip a car body with wood parts or framing, but the owner of such a car needs to be prepared to deal with a lot of extra clean up chores later on. If the acid it left on the wood, it will soften it and ruin it. Metalworks also warns that even with an all-steel body, the proper preparation of the vehicle metal parts is very important for high quality results. Some basic prep work to the vehicle is required prior to dipping it. Things like liners or matting inside a vehicle can create a huge mess if a car is dipped without removing them entirely. As much interior matting as possible should be removed from the vehicle, including interior roof matting. Leaving matting inside a body will prevent carrying out the normal complete cleaning process a car body undergoes. It also creates a huge mess in the dip tanks and wash area. Taking such materials out of a car requires extra work and if the dipper has to do it for you, the dipper will charge for added time required for dipping and cleaning up. Before dipping a vehicle, another very important recommendation is to remove all the door and trunk hinges A car body or pickup truck cab can be dipped with door hinges attached, but Metalworks has good reasons for its recommendation against doing things that way. When the door hinges are left in place on a vehicle, they prevent the dipper from carrying out the usual step of fully cleaning and rinsing the metal behind where the door hinges attach. Parts made out of aluminum will "go away" if they are put in the dip tank for any extended period of time. In fact, they often go away immediately. On many cars the vehicle identification number tags and other nomenclature plates are made of aluminum and riveted to the firewall, door jambs, seat riser, etc. Aluminum parts will quickly be destroyed if dipped in the hot acid tank. We can vouch for this happening with aluminum items. At the same time our MG parts were being dipped, we decided to have two vintage body shop cabinets that we're restoring cleaned the same way. We did not realize that the door hinges on the cabinets were attached with aluminum rivets. When the cabinets came back, the doors were no longer attached to them. The aluminum rivets self-destructed. Of course, this can be readily taken care of with a pop rivet gun, but if we had dipped parts with tags, the serial numbers would be gone. Leaf springs and coil springs are heavy metal parts and you might assume that they could be de-rusted by dipping them. That isn't the case. Spring steel cannot stay in a tank as long as a body or sheet metal. Spring steel must be removed within just a few hours so it doesn't suffer hydrogen embrittlement. This occurs mostly in high-strength steel. Embrittlement will cause it to become brittle and crack after exposure to hydrogen. Steels that have a Rockwell hardness rating above C30 are most vulnerable. On your collector car, such steel hardened spring steel would be also be used for hood springs and trunk springs. You must remove all of these parts before doing any acid dipping. Hydrogen embrittlement can actually be reversed if the metal has not yet started to crack. Hardened metals that would normally start to get brittle can be heat treated to remove the hydrogen that's been absorbed into them. There is a time limit of four hours between exposure to acid and the heat treatment, which involves baking out entrapped hydrogen after acid dipping a vehicle or parts. Veteran dippers like Metalworks are the best companies to work with since they have "seen it all." Professionals there will carefully inspect each project and give the car owner, body shop professional or restorer expert advice on the dipping process and how it will work with each individual vehicle. They will know if a vehicle has been properly prepared for going in the dip tank. If an item hasn't been properly prepped, no dipping will be done until the problems are rectified one way or the other. The additional prep work that's needed can either be taken care of by the customer (which usually means taking the vehicle home and bringing it back later) or immediately, by the dipper, with additional costs. After the dipping session, most dippers will pressure wash the vehicle with a neutralizing agent. They will work to get this solution into all hidden spots. They will also try to bake out all of the residue that might be hidden inside the body seams. There is always a slight chance they may not get all of the acid, but they are experienced at this and rarely miss a trick. Any acid that remains in hiddem areas of the vehicle will eventually become reactivated if even a tiny bit of moisture hits it. You will not know what's going on, since the acid will be working inside a seam or joint that's sealed and refinished. Professional dippers like Metalworks do all that's possible to neutralize the acid and avoid any problems. After parts are dipped in an acid tank the bare metal will be prone to rust and it should be primed as soon as possible. This acid-dipped hood has been treat to a couple of coats of gray primer. The vehicle owner should also give the car or truck a close inspection after it leaves the dip tank and comes home. The big thing to look for is any unpainted areas under body, door, hood and trunk bracing that need special attention. Somehow getting primer and paint on such areas is of the utmost importance. Bare metal will oxidize rapidly and start changing into iron oxide and this is something you can definitely do without after paying for a dip in a hot tank. In case you are wondering about the price of hot tank dipping, at the time of the writing of this book, Metalworks would charge $2196 plus a 3 percent environmental fee for doing a Camaro body, hood, two doors, two fenders, fender extensions, deck lid, cowl and vent, two inner fenders, radiator core support, front header and front valance as a complete one-shot deal. In our case we had the MG hood, four fenders, running boards, gas tank and two shop cabinets stripped (including shipping) for $700. We estimated that it would take 40 hours at $55 per hour — or $2,200 — to have the same items stripped in the body shop.